Mumbai’s Eastern Freeway is from Ghatkopar in the North to P D’Mello Road and Museum/Fort in South Mumbai. 16.4 Km Eastern Freeway has NO TRAFFIC SIGNALS and bypasses 28 signals. Eastern Free has NO TOLL, it is a FREE Road. NOTE: Only Cars, SUVs and Buses are allowed on the Eastern Freeway. Scooters, Motorcycles, Bikes, Autos, 3-wheelers and multi-axle vehicles are NOT ALLOWED on the Eastern Freeway. 1 Orange Gate (Princess Dock) near P D Mello Road ENTRY and EXIT SOUTH MUMBAI: Carnac Bunder, Wadi Bunder, Dockyard Road, Mazgaon, Byculla, Masjid Bunder, Fort, VT, Colaba, Nariman Point, Churchgate. Please click here to view Eastern Freeway, Mumbai Map in a larger map. Anik To Panjarpol (Shivaji Chowk, Chembur) Link Road (APLR): 8 lane concrete road along the ground from Panjar Pol at Chembur’s Shivaji Chowk to Anik (near Wadala, Antop Hill), via BARC hill (2 tunnels) to. Distance = 5.0 km. P D’Mello Road To Anik (near Wadala): Elevated 4 lane Bridge from Anik (near Wadala, Antop Hill) to P D Mello Road outside Princess Dock (“Orange Gate” near Wadi Bunder and S V Patel Road). This is the SECOND LONGEST BRIDGE IN INDIA. Distance = 9.3 km. This segment of the Eastern Freeway will become operational in December, 2013. The Entry / Exit point of Eastern Freeway is near Indian Oil Nagar (Jijibhai Bhosale Marg) on the Ghatkopar – Mankhurd Link Road. This Start/End of the Eastern Freeway is only 1 Km away from the Eastern Express Highway at Ghatkopar. From Ghatkopar a new 4 lane Eastern Freeway bridge passes Gautam Nagar and Ashok Nagar. The bridge Ends/Starts at Pranjol at the Shivaji Chowk in Chembur. Other entry/exit ramps are at Govandi and Panjarpol. A new 8 lane Eastern Freeway concrete road is built from Shivaji Chowk (Panjar Pol) circle in Chembur to Anik near Wadala. Route of APLR Starts / Ends at Panjarpol at Shivaji Chowk circle in Chembur, passes Tata Power Colony, passes 2 tunnels near BARC, passes between RCF and Bharat Petroleum and Ends / Starts at Anik (near Antop Hill, Wadala). This new road is along the ground. There are two 505 meter tunnels which pass through the hills near BARC. Both these tunnels have 4 lane concrete roads passing through. Exit and entry points are at Anik (Bhakti Park), Mysore Colony and Shivaji Chowk, Chembur (Panjarpol, R K Studios). 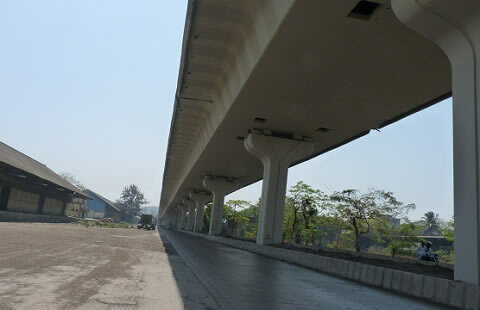 Starting / Ending at Anik near Wadala and Antop Hill, this section of the Eastern Freeway starts with a 0.7km bridge over Salt pans until MbPT’s Pipe Line Gate. From Pipeline Gate a new 4 lane Elevated Bridge (2nd longest in urban India) passes along Antop Hill, Wadala, Sewri, Raey Road, Dockyard Road, Mazgaon Dock, Mazgaon, Wadi Bunder. The Exit/Entry point of the Eastern Freeway bridge is Orange Gate (Princess Dock) on P D Mello Road. There is an Entry ramp at Reay Road, an Exit ramp at Mumbai Port Road (near Nawab Tank Road) and an entry + exit ramp near Sewri Railway Station. 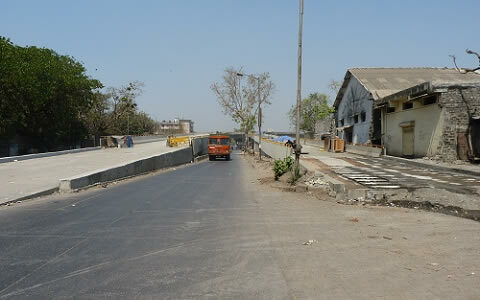 Large part of the 4 lane bridge is built over Mahul Road, which is the primary feeder road to Mumbai’s ports. From P D Mello to travel to VT/CST, Fort and Museum (Regal), continue along the straight P D’Mello Road. This is the road that runs parallel to the JJ Flyover and is behind CT/CST station. This road crosses Carnac Bunder and Frere Road and ends near the GPO and CST/VT Station (Back side). Continue straight along the Shahid Bhagat Singh Road up to Museum, crossing Mint, RBI, Asiatic Society (Town Hall) on the way. 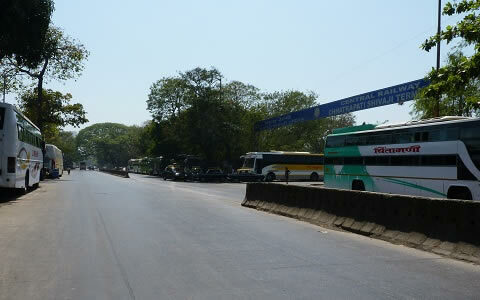 Eastern Freeway will reduce travel time from Museum (Colaba) to Ghatkopar to 25 – 30 minutes from 90 minutes. The three part, 16.8 Km Eastern Freeway has NO TRAFFIC SIGNALS and is TOLL FREE. The Eastern Freeway bypasses 28 traffic signals and this will drastically reduce the time taken to travel from South Mumbai to Wadala, Antop Hill, Chembur, Mankhurd, Ghatkopar, Navi Mumbai and Thane. The Mumbai Monorail and Eastern Freeway will reduce the traffic load on the North-South arterial Dr Ambedkar Road (Sion to Dadar to Lalbaug) and Sir J J Flyover. 2-Wheeler, 3-Wheeler and multiple-axle vehicles are NOT ALLOWED on the Eastern Freeway. Motorist exiting the Eastern Freeway at P D’Mello Road can reach VT/Fort/Museum by continuing straight on PD Mello Road, which runs parallel to the JJ Flyover until GPO and VT Station. From there motorist can continue straight along the Shahid Bhagat Singh Road until Museum/Regal. The 9.3 Km bridge from PD Mello Road to Anik is the second largest urban bridge in India. 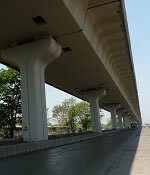 The 75 feet Eastern Freeway bridge at Shivaji Chowk (Chembur) is the tallest bridge in India. It is designed to accommodate future Metro train viaducts. 20 new BEST Bus services will operate on the Eastern Freeway. This is the first major land road in Mumbai in many decades created by the Govt of Maharashtra and it is one of the many infrastructure projects that will transform Mumbai in 2013 – 2014. The Eastern Freeway will play an important role in dispersing traffic to the North and South of Mumbai once the Mumbai Trans Harbour Link (MTHL) Bridge (Sewri with Nhava) is constructed. 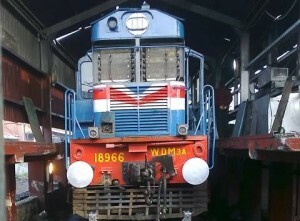 Mumbai Metropolitan Region Development Authority (MMRDA) is the government agency responsible for the funding and construction of the Eastern Freeway. When first envisaged, the cost of Mumbai’s Eastern Freeway was Rs 341 crore. In 2008, the cost was revised to Rs 531 crore. 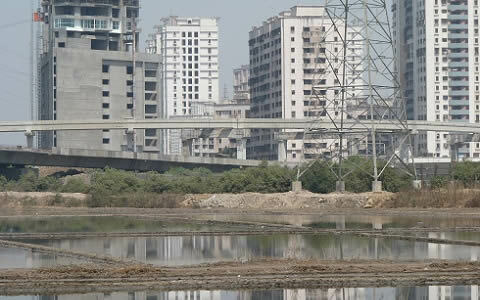 It is now estimated that the cost of the East Freeway is Rs 1,140 crore. Rehabilitation of displaced people on P D’Mello Road, APLR and between Panjrpol – Ghatkopar took longer than expected. In July, 2012, 13 concrete segments of the Eastern Freeway collapsed, killing 2 workers. Work was stopped while MMRDA investigated the cause of the collapse. MMRDA eventually fined the contractor, Simplex Infrastructure. The underground utilities maps were incorrect, leading to delays. Environment clearances, especially for the bridge over Wadala Salt pans and the stretch near Ghatkopar took time. In the next phase, MMRDA will explore whether the Eastern Freeway can be extended from Museum/Regal to Nariman Point using a tunnel. MMRDA will also explore whether the Eastern Freeway can be connected to the Borivali-Nariman Point Coastal Road. This will create a Ring Road around Mumbai. New Roads, Metro, Monorail, Bridges, Infrastructure in Mumbai.